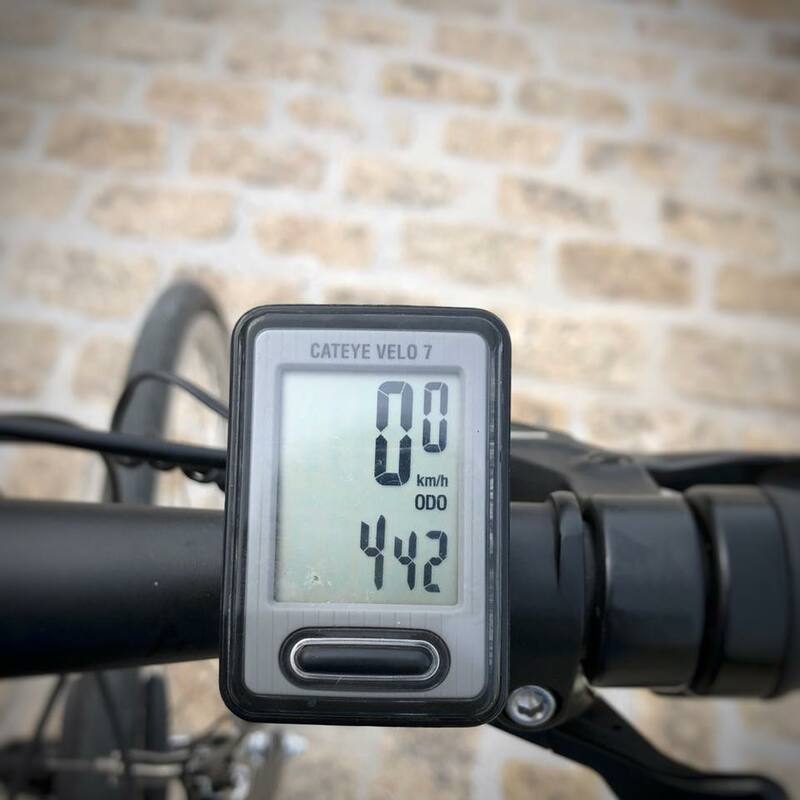 Come with me on this journey, cycling through northern Portugal and northwestern Spain, from Coimbra to Santiago de Compostela. 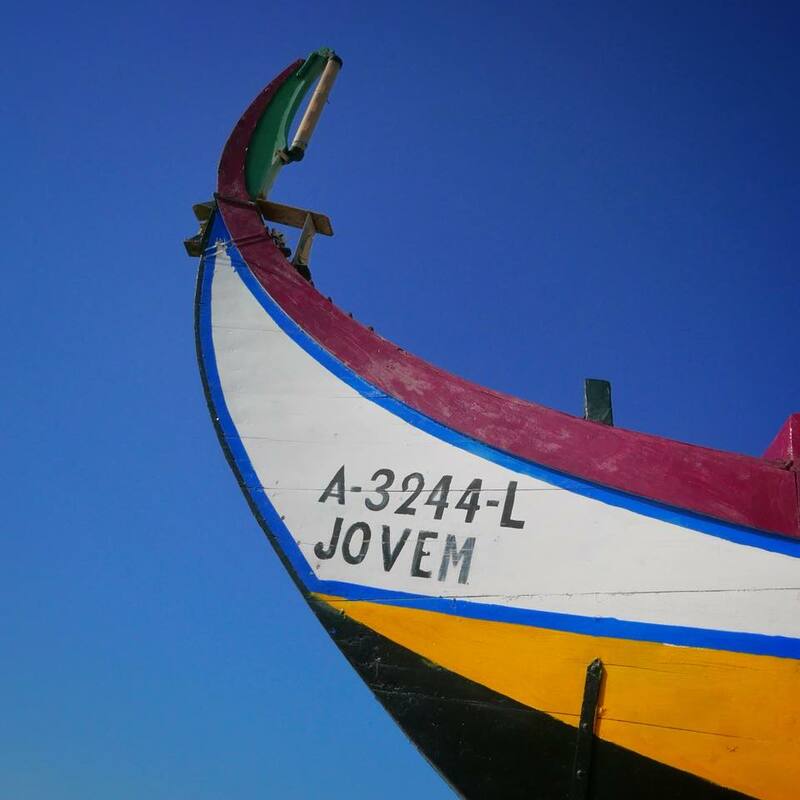 It's a 12-day, 300-some-mile trip through Portugal's hilly green interior and along the beachy Atlantic coast. We're going with the expert tour operator Experience Plus, which will take care of pretty much everything. 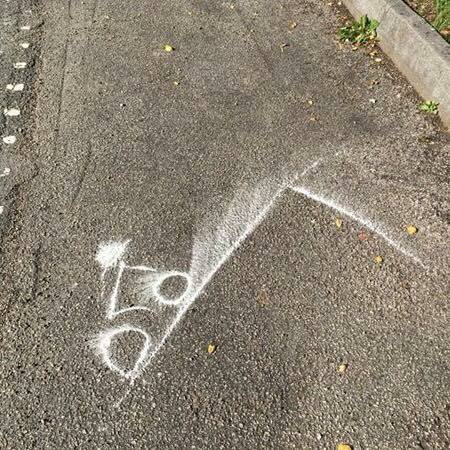 All we need is a helmet! One night in Lisbon. The quiet Hotel Lisboa Plaza is around the corner from busy Avenida da Liberdad. 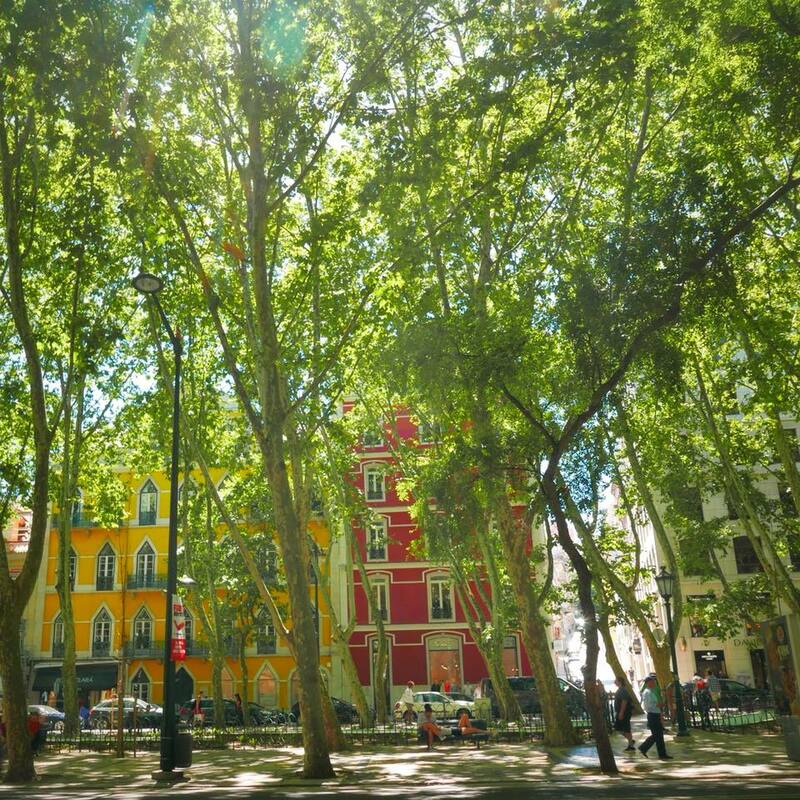 It’s a gorgeous afternoon for a stroll along Avenida da Liberdade, Lisbon’s version of the Champs-Élysées. 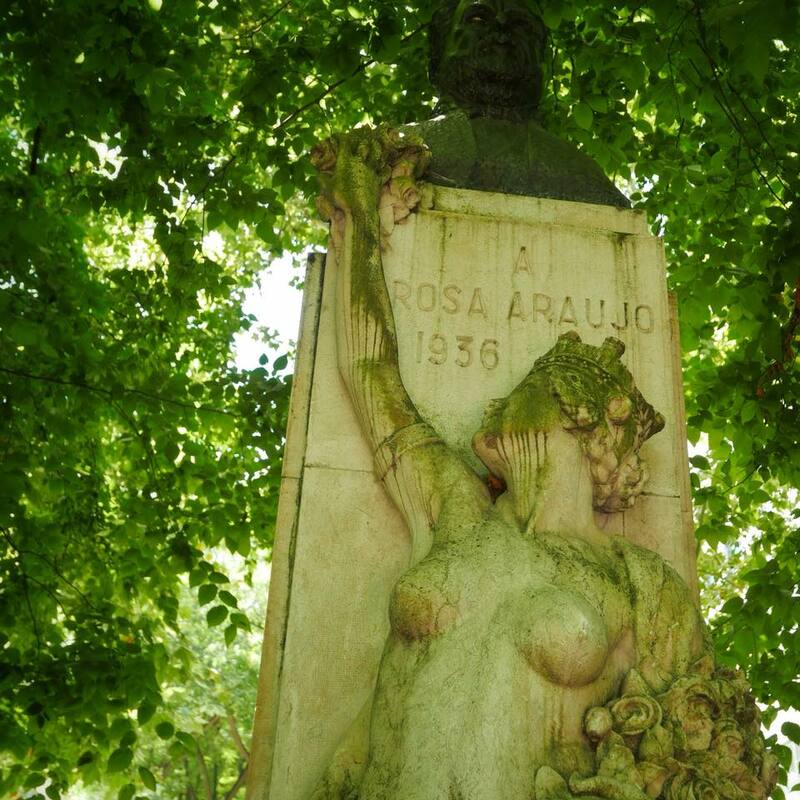 The tree-lined avenue is punctuated by massive monuments and intimate statues. Lingering is an art form, whether at outdoor cafés or park benches. The preferred cup is a bica, a long espresso with heaps of sugar. 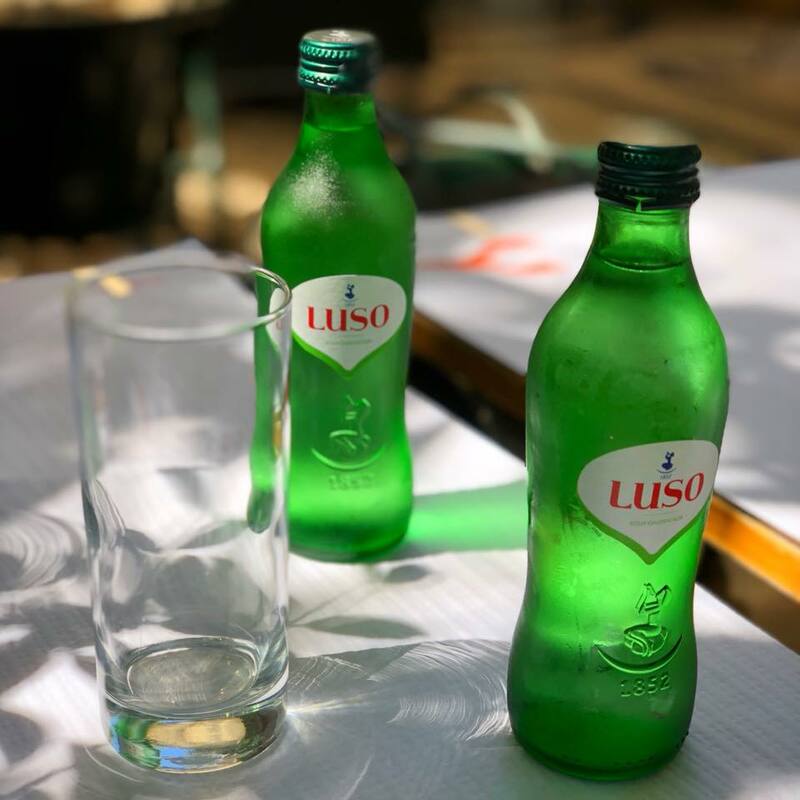 I can’t do caffeine in the afternoon, so it was sparkling water when I met up with Ann Abel, a fellow writer who lives in Lisbon. She gave me some great suggestions, some of which you’ll see later. Icons: Lisbon’s tram, each with a unique design, sometimes in graffiti; and anything made out of cork, such as these postcards with more iconic images. Age of Exploration: Belém houses myriad monuments and museums, but we don’t have much time. Where the Tagus meets the sea, the Torre de Belém and the Padrão dos Descobrimentos both commemorate the explorers who set out in caravels: da Gama to India, Cabral to Brazil and India, and Dias to round the Cape of Good Hope, as well as their patron, Henry the Navigator. The tower was built in the 16th century; the massive monument, shaped like a ship’s hull seemingly about to set off, is a contemporary design. Lisbon, Portugal. 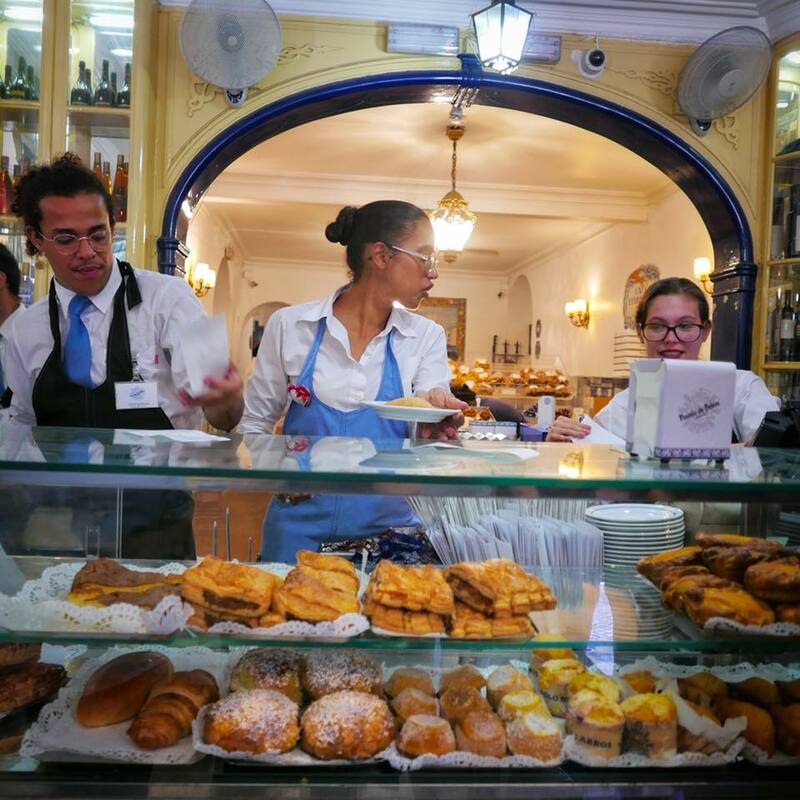 Belém treats: Can’t leave this district without picking up one, or five, Pastéis de Belém, still warm from the oven. The custard tarts have been made here since 1837, using a secret recipe from the monastery nearby. The eggy, creamy center nestled in thin, crisp layers of dough really tastes like a bit of heaven. You’ll hear the heavenly strains of this busker with an accordion before you see him as you walk through the underground passageway between the main town and the seaside. Lisbon, Portugal. Cradle of the city: The oldest quarter of Lisbon is the Alfama, with its cobblestone streets, narrow, twisty alleys, and laundry airing outside windows. 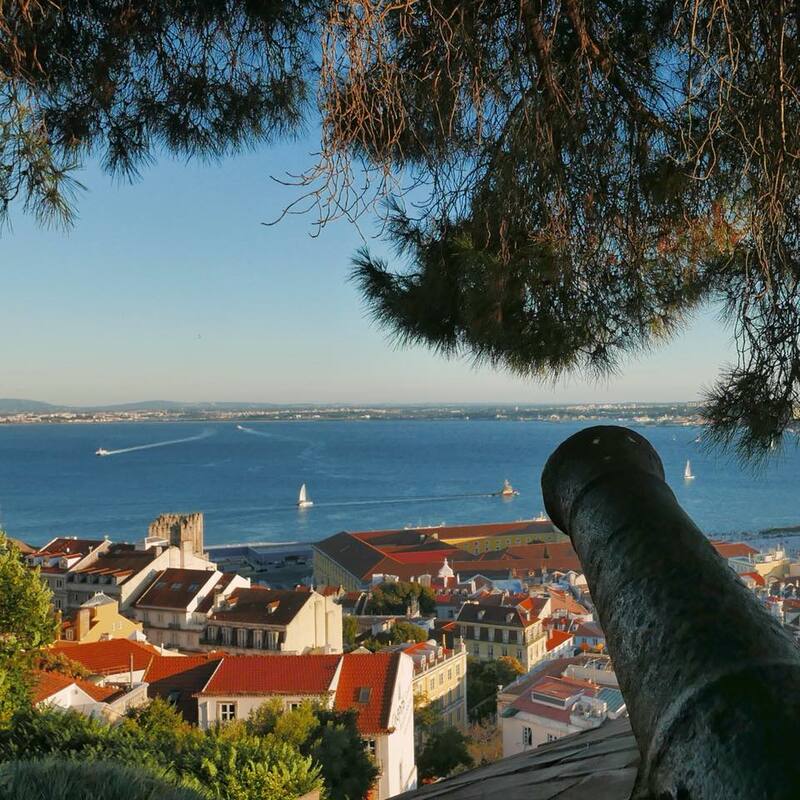 There’s no better place to see the sunset than Castelo de São Jorge. Built by the Visigoths in the fifth century, expanded on by the Moors in the eighth, and gussied up and turned into a royal palace in medieval times. 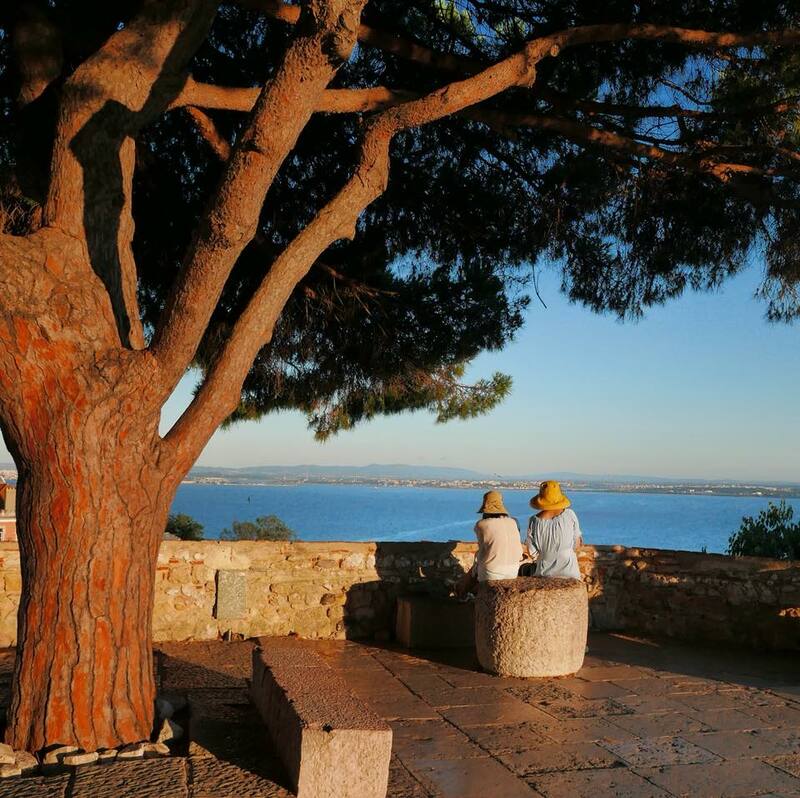 Long and lovely: The light just before sunset at the Castelo de São Jorge. Lisbon, Portugal. 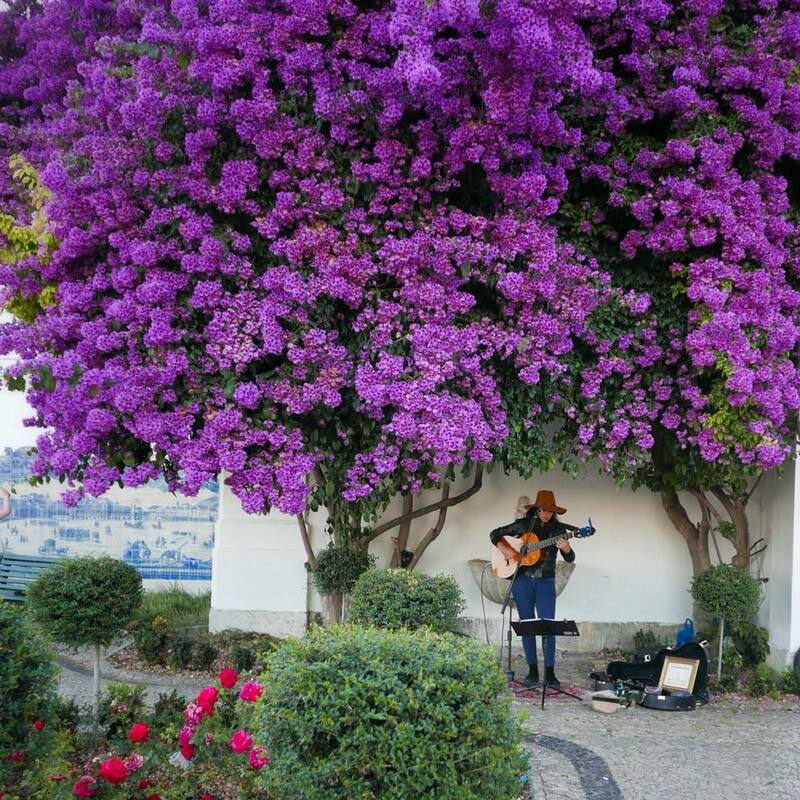 Music hath the power: At seemingly every corner and every pocket park in the Alfama, singers and musicians, like medieval troubadours, find a stage. 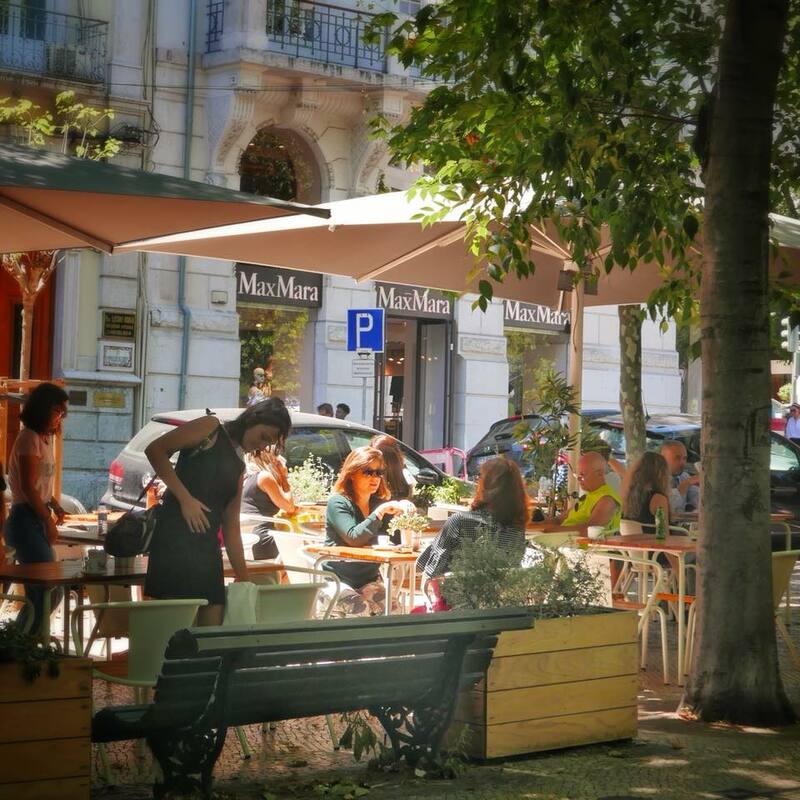 This is the neighborhood to hear fado, sometimes called “the blues of Portugal” and “the musical expression of the nation’s soul.” Many restaurants feature performances along with the food. Sometimes the performer is better than the food, as was the case with Marta Soares at the Royal Fado restaurant last night. Tchau, Lisbon. We’re headed north. At the beautiful and light-filled Oriente train station, designed by Santiago Calatrava. Portugal. Old school: When was your university founded? The Universidade de Coimbra dates to 1290. It’s also incredibly beautiful, and a template for school complexes throughout the Portuguese-speaking world. 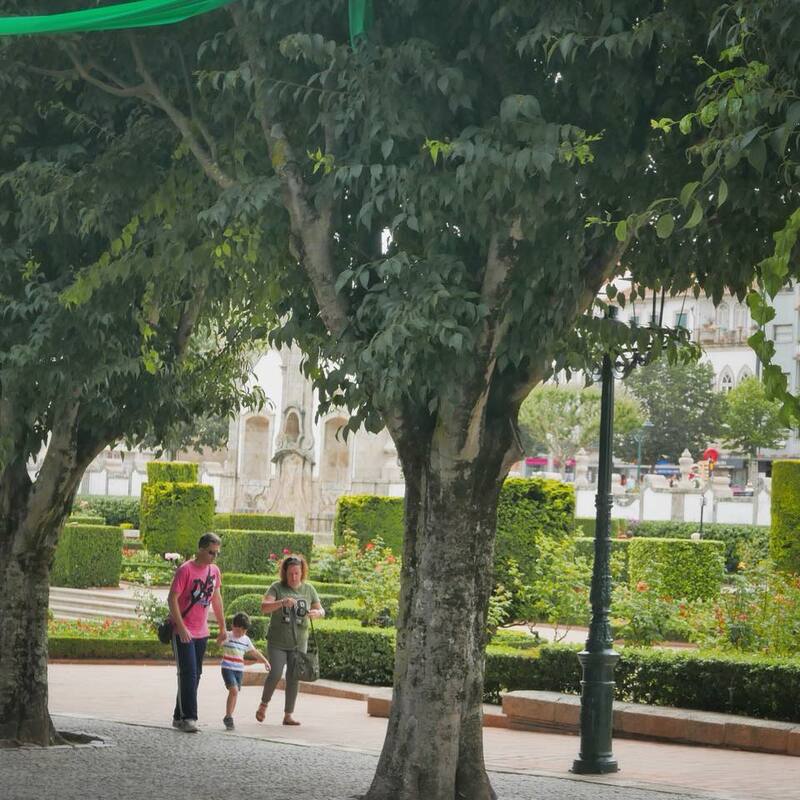 It’s set on a hill and the main courtyard has expansive views and a statue of King João III. 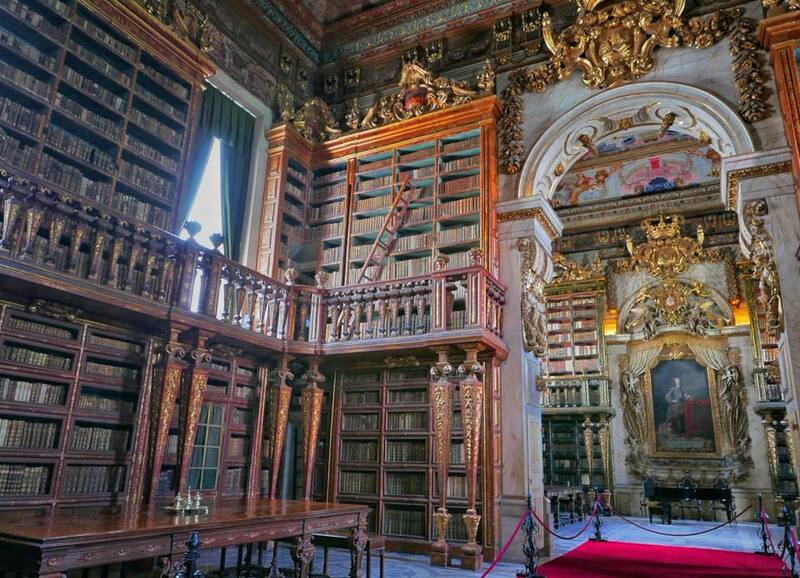 The crowning glory is the Baroque Library—built in the 18th century and housing 60,000 books mostly in Latin, including a bible from 1462. Some bookish bats live here too, feasting on the insects that might otherwise destroy the tomes. There’s so much else to see in this UNESCO World Heritage site, but once again we’ve run out of time. A night at Quinta das Lágrimas, an 18th-century palace turned hotel. Coimbra, Portugal. 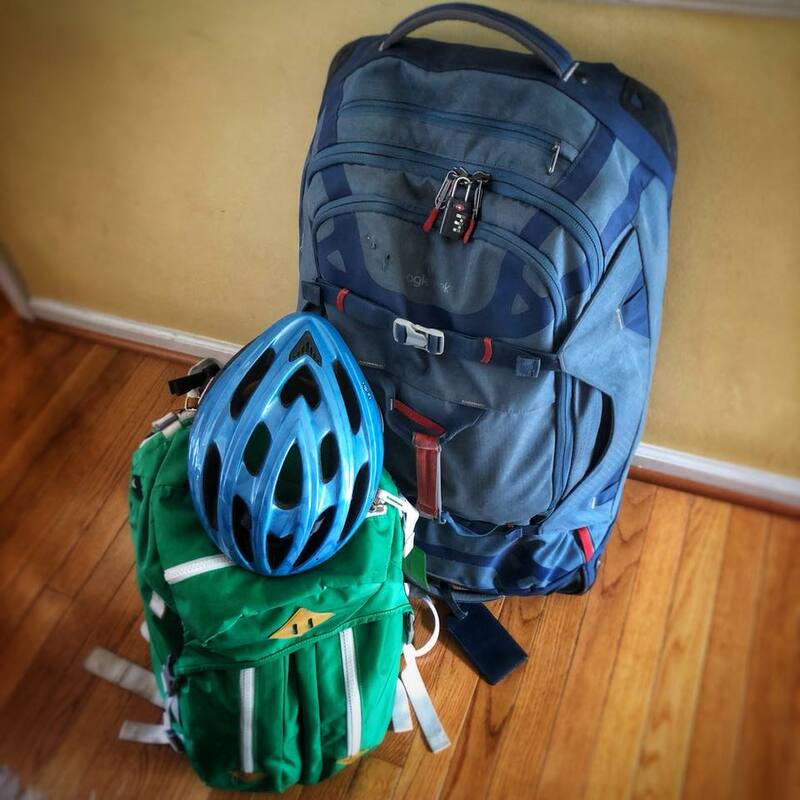 You know I’ve taken you on a cycling trip, right? Today’s ride is 40 miles, from Coimbra to Aveiro. We’re going through the narrow lanes of hamlets, woodland, and farmland along the Mondego River. Northern Portugal. Venice? 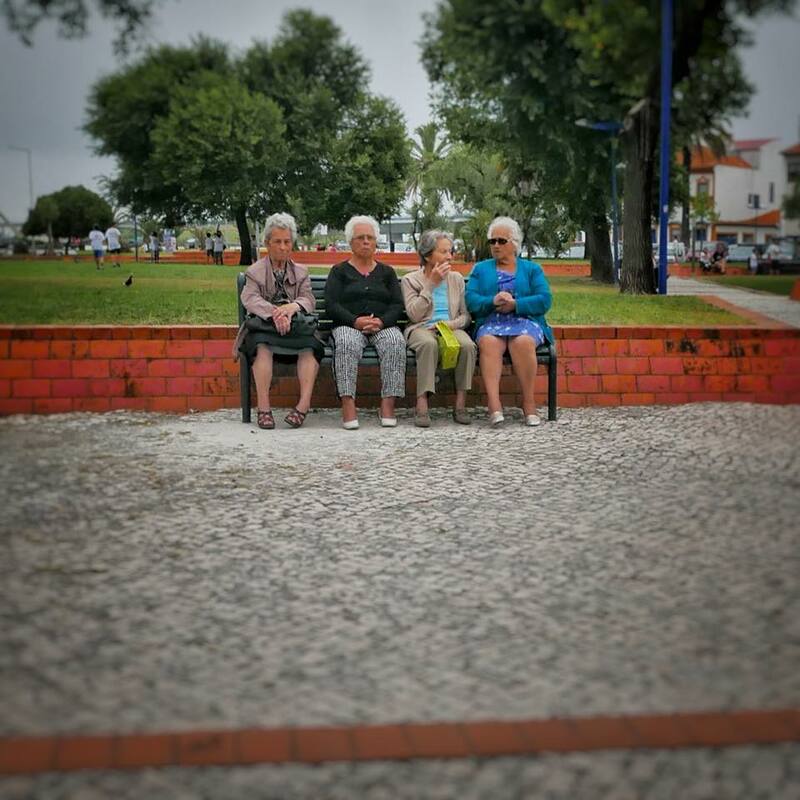 No, it’s Aveiro, northern Portugal. 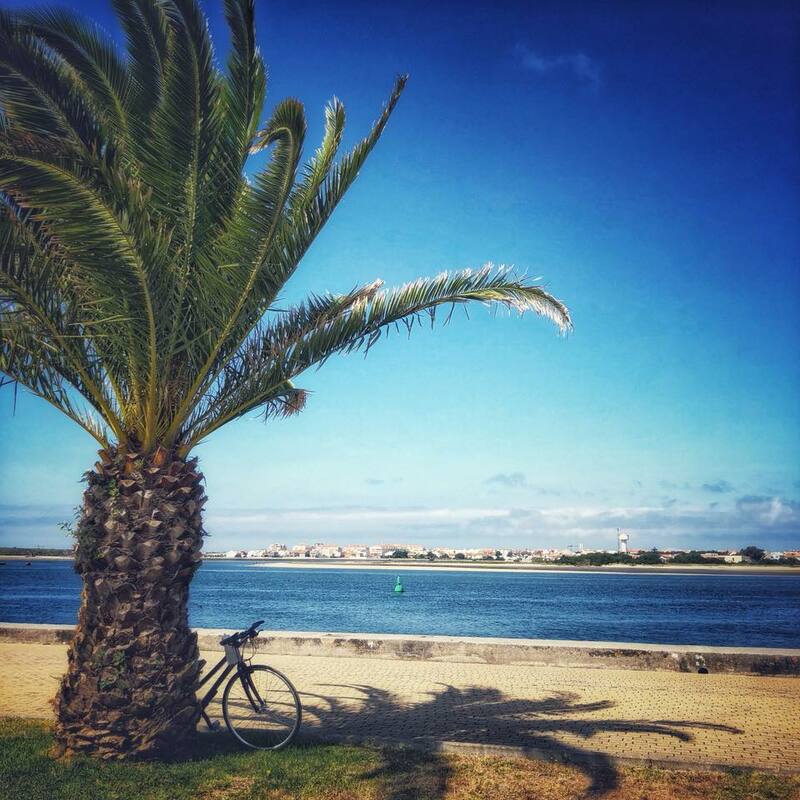 Sea, sun, salt: The ride from Aveiro to Furadouro includes all of these essentials. The water you see is actually an estuary, the tidal mouth of a large river. 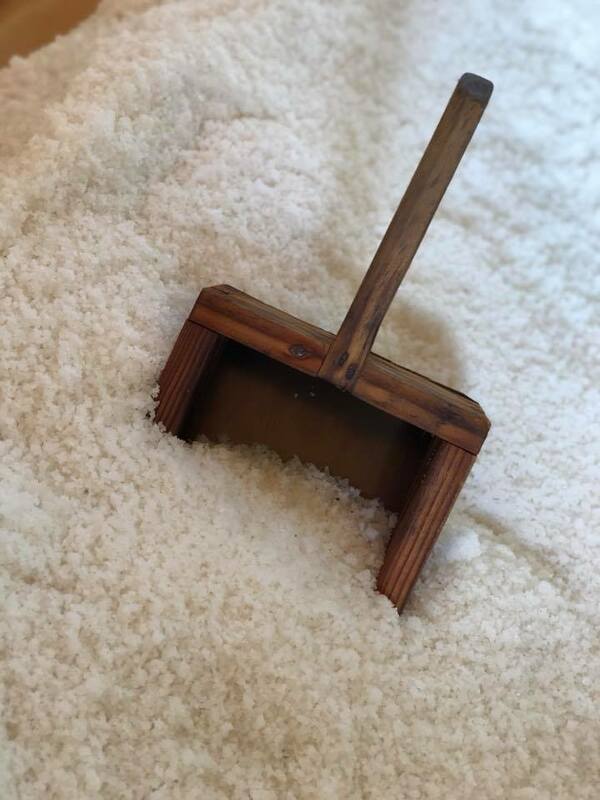 The highly prized Aveiro salt—said to be full of minerals—is made from this water, in a time-intensive process used for generations. Northern Portugal. 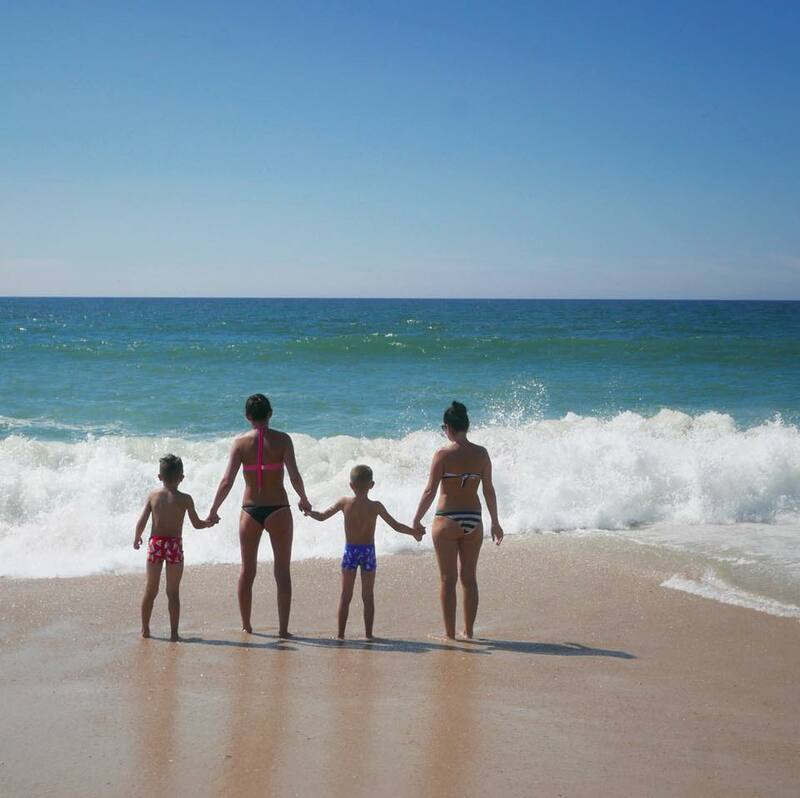 By the sea: Praia do Furadouro is a small resort town on Portugal’s Atlantic coast. Can’t we stay for longer than a night?! 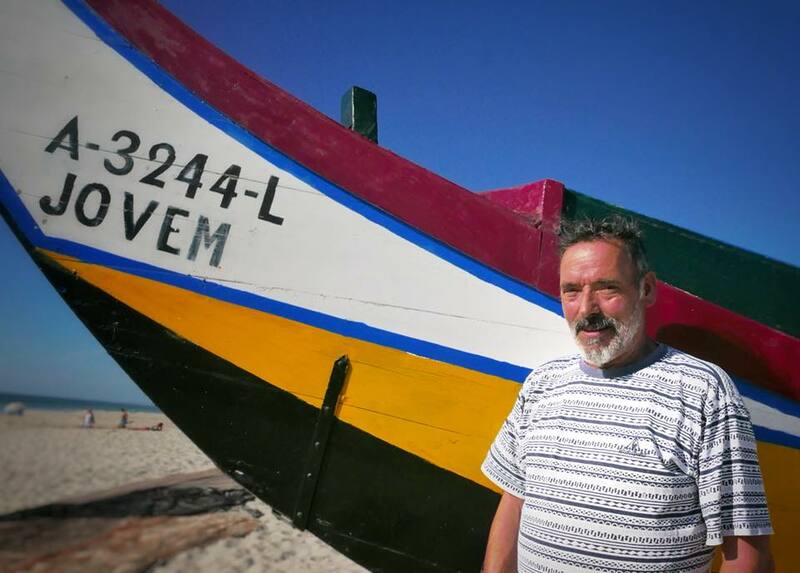 Fish tale: For 10 generations, Armando Maganinho’s family has been net fishing in Furadouro, using a traditional method called Xávega. But collapsing fisheries and cheaper industrial methods mean there is only one boat left fishing in this way. (Armando himself no longer fishes following an injury to his leg, though he and his family own several seafood restaurants). 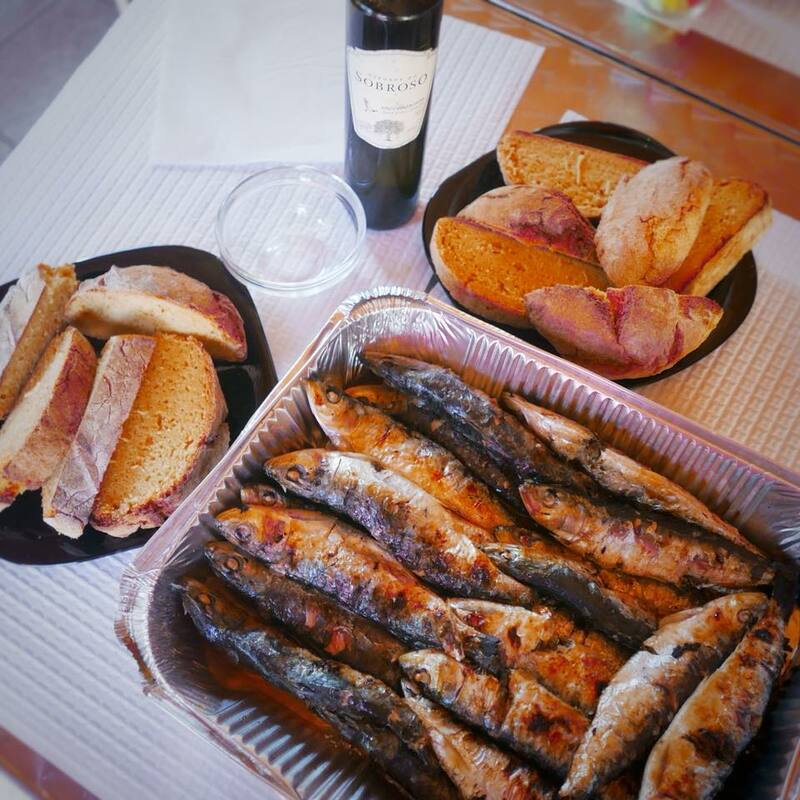 The main catch in these parts: mackerel and the Portuguese favorite, sardines. And the preferred cooking method: salted and grilled, and drizzled with olive oil at the end. 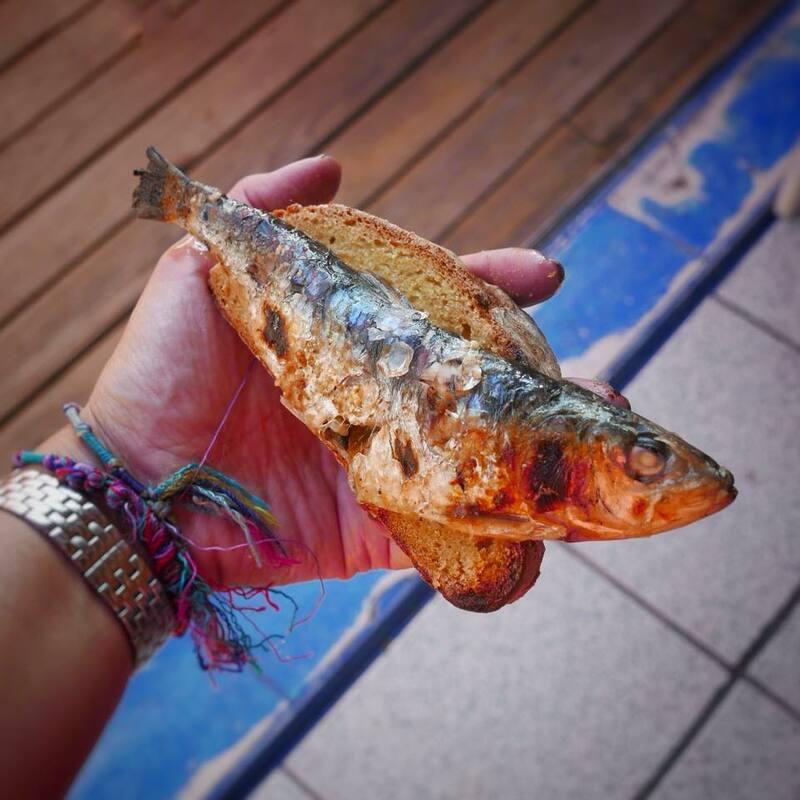 The proper way to have it is on a hunk of bread and eaten with your fingers; the bread acts as a plate and only after you’ve had your fill of sardines do you dip the bread in the grilling pan dregs. I’ve always loved sardines, but now even more. Northern Portugal. Sunset at the Praia do Furadouro and it’s practically deserted. Portugal. 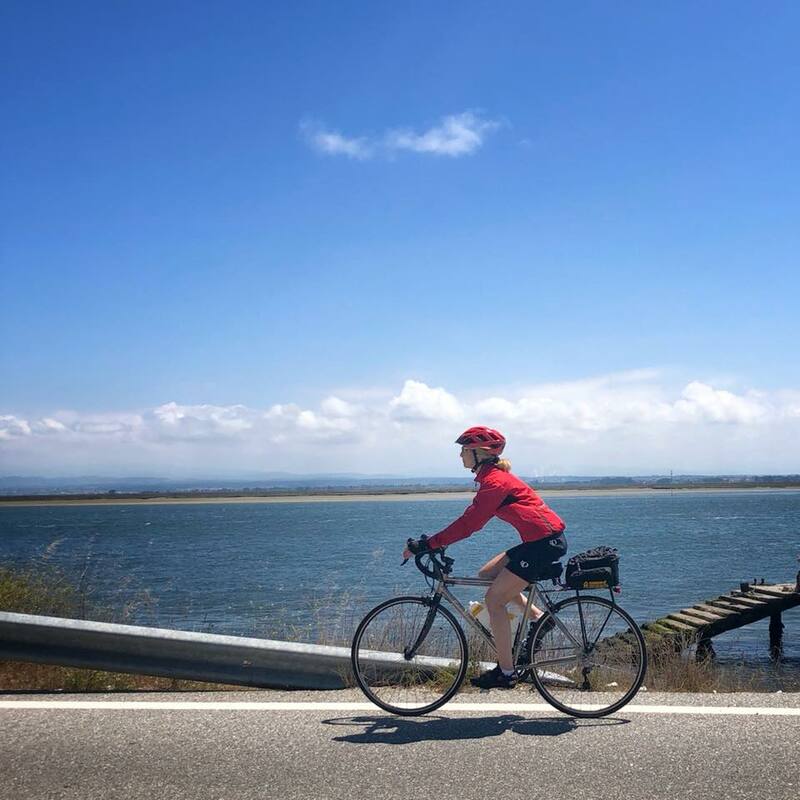 The road to Porto: In the morning we have a 33-mile hilly ride into the interior of Portugal, through rural roads, small villages, and larger towns. In the afternoon, a cruise on the Douro River makes a grand entrance into Porto. Portugal. 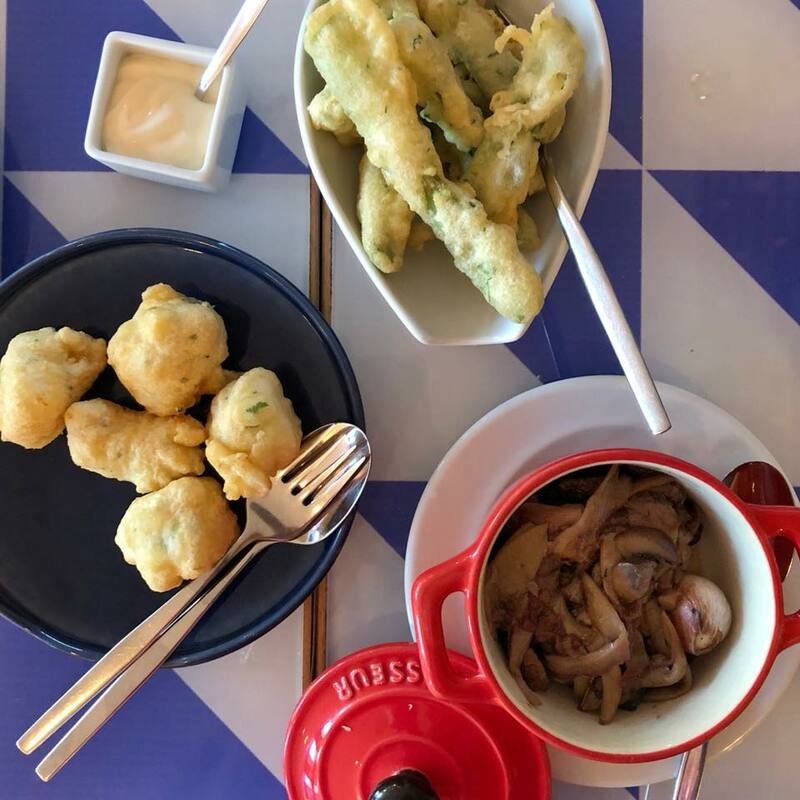 Porto-cool: There’s a fresh energy in this old town, whose beginnings go back to pre-Celtic times—in its cuisine, aesthetic, and youthful vibe. Even port wine has a brand new buzz. Porto, Portugal. People watcher, urban stroller, flâneur? 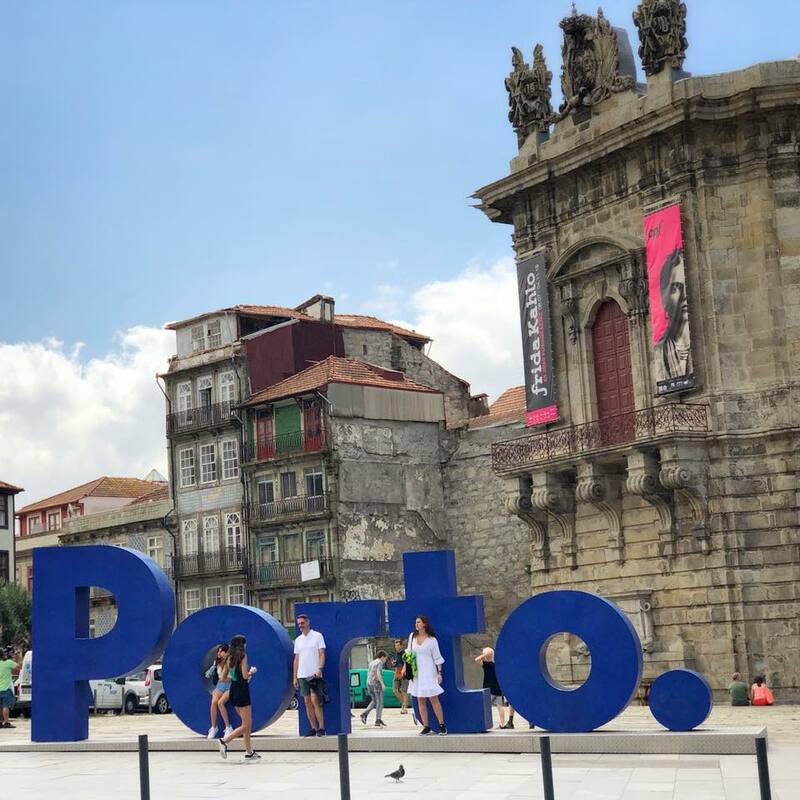 Porto is for you. Writers retreat: J.K. Rowling spent two years in Porto in the early 1990s. Close readers of Harry Potter have identified possible spots of inspiration, including the Livraria Lello and its curvilinear crimson staircase; the Fonte dos Leões which looks like a griffin (but really isn’t); and the Majestic Café, which some say was too fancy for a starving artist. Urban legend or no, these opulent and fantastical settings would surely cure any case of writer’s block. Northern Portugal. 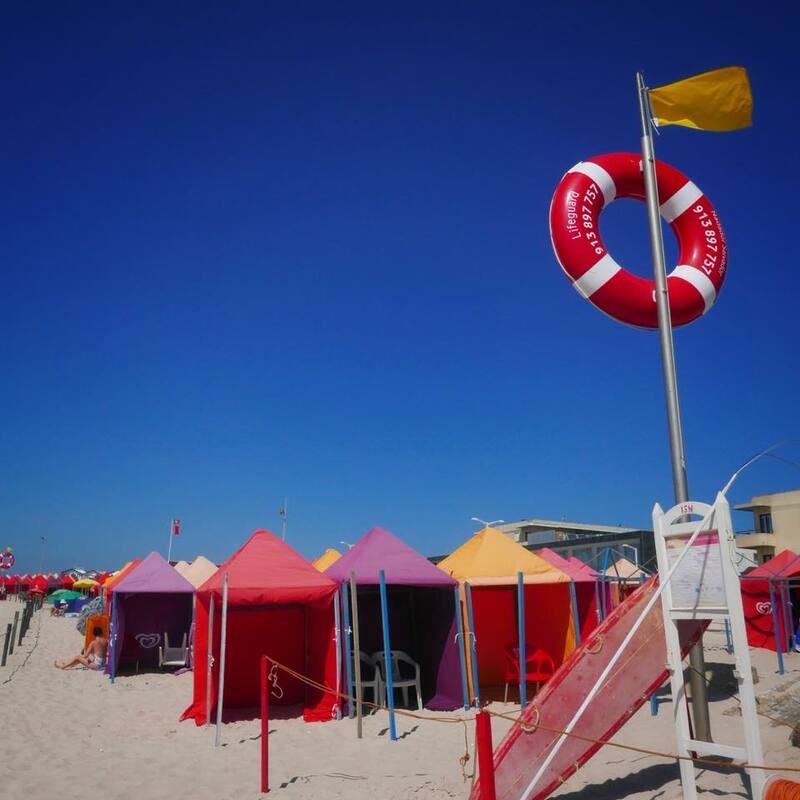 Até a próxima, Porto! Leave we must, but this evocative and sensual city calls for a return visit. 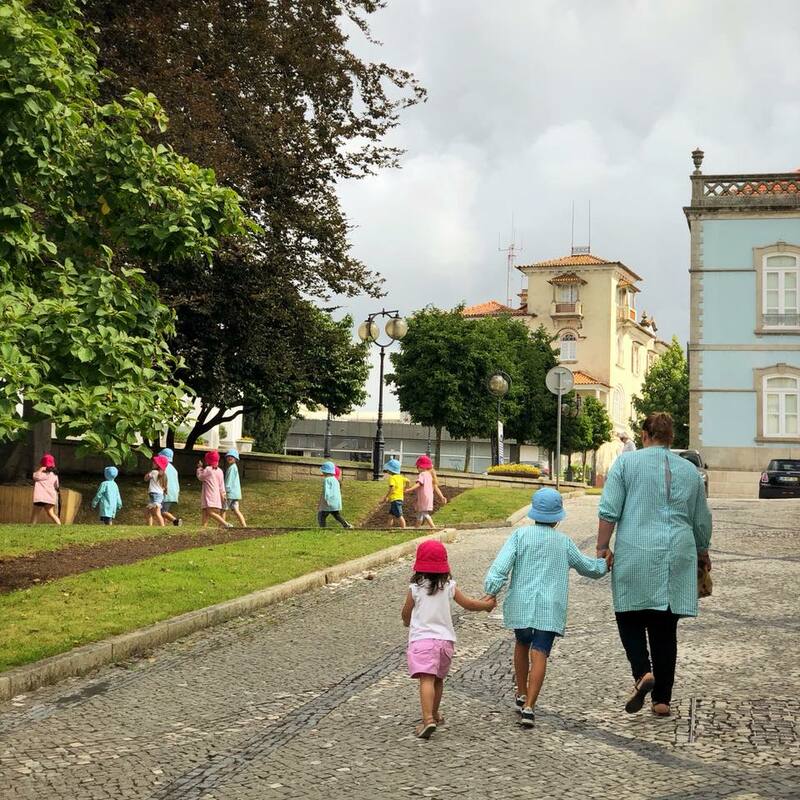 On the road to Barcelos: Atlantic beach resorts, inland villages, narrow roads lined with medieval-era walls, and churches modest and not so. The attendant aromas change as well, from seaweed salty to farm pungent. Northern Portugal. 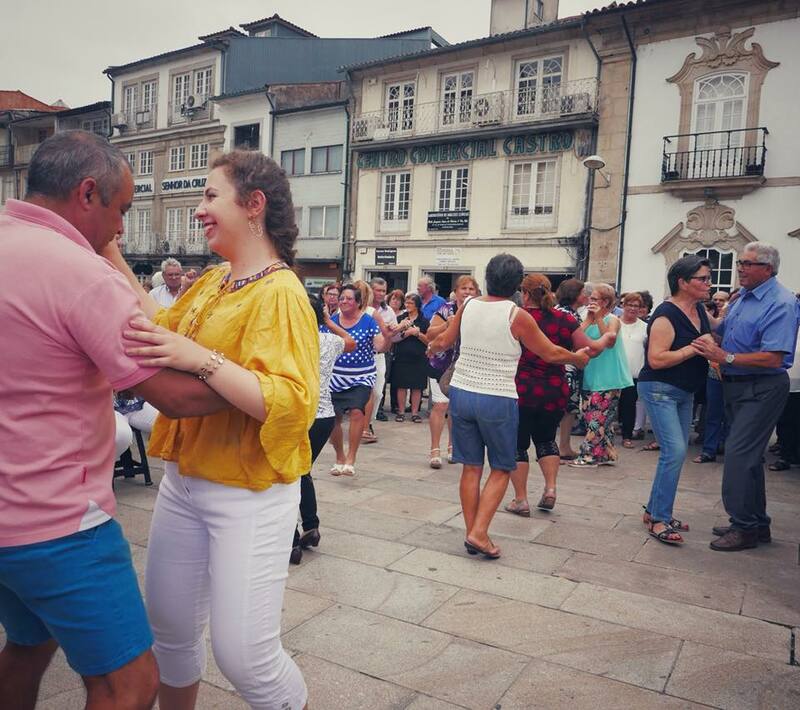 After bustling, tourist-filled Porto, Barcelos feels small and intimate. 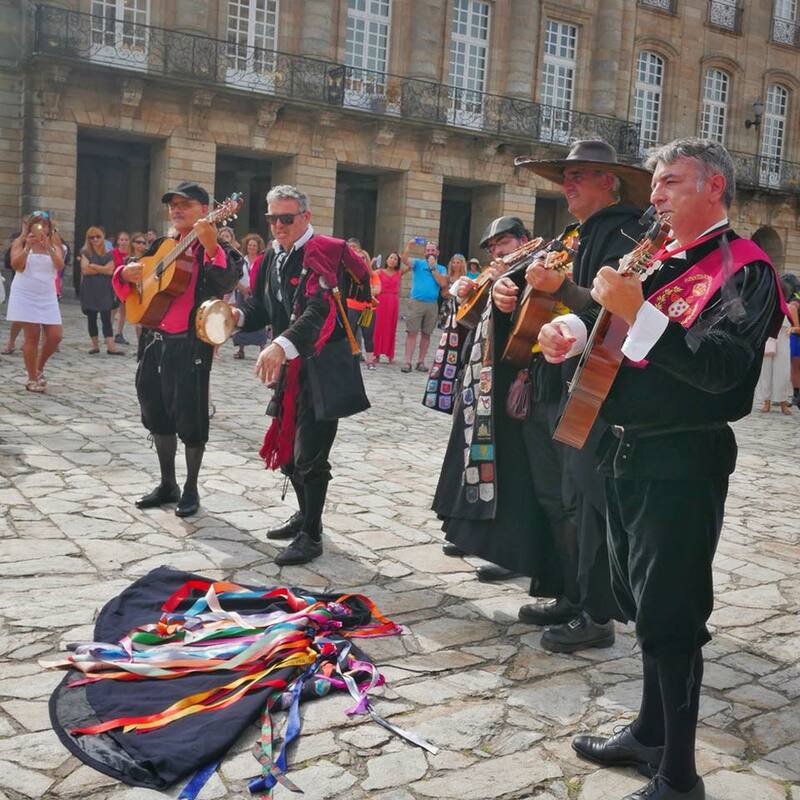 There’s a strong local flavor, and the town square was lively with a flea market, an accordion festival, and dancing in the streets. We’re in Ponte de Lima, Portugal’s oldest town, with a charter going back to 1125, though settlement goes back earlier. The bridge which gives the town its name may date back to the first century, when the Romans opened up this area; there’s an interesting legend about the Lima River and the bridge (Google it) which accounts for the sculptures nearby. We’re also in the heart of vinho verde country. Portugal’s famous “green wine” comes from using grapes that haven’t ripened. (It’s not a grape variety but a manner of making wine.) The result is fresh, light, slightly fizzy, and altogether delicious. Adeus, Portugal! Hola, España! 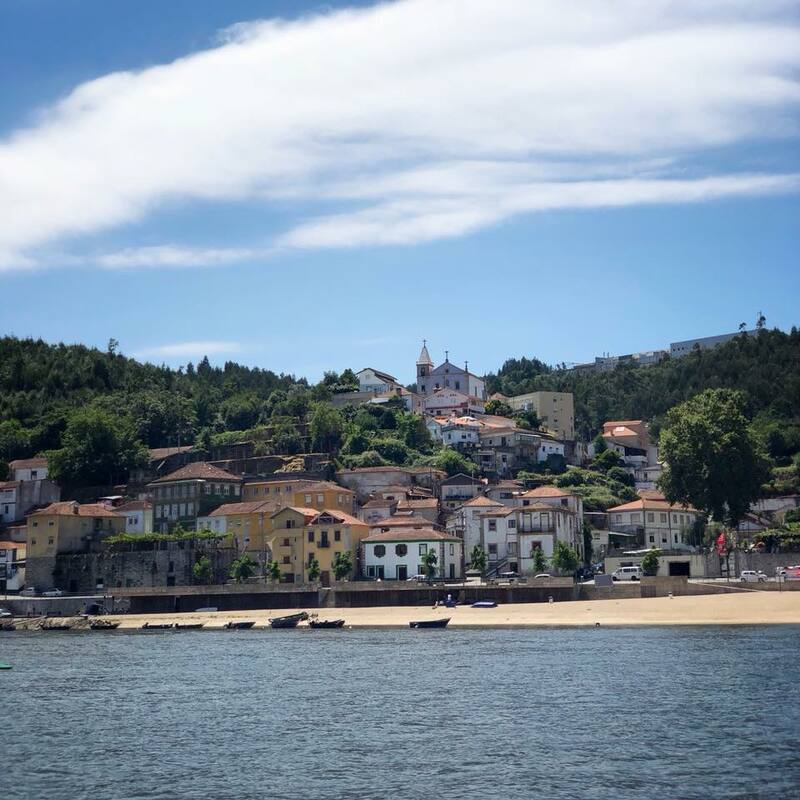 We cross the Minho River dividing the two countries on a small boat and haul our bikes onto the beach, and hug the coast all the way into Baiona (50 miles total, taking Advil tonight). The Galician coastline is windswept and wonderful. I’m in love; do I have any friends who live here?! 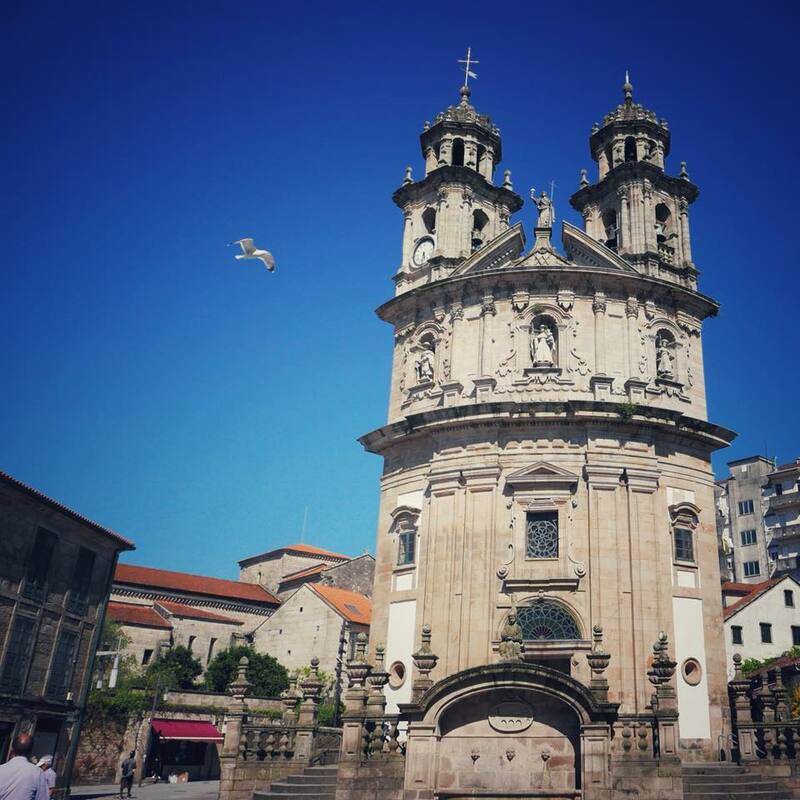 The strategic port town of Baiona has seen its share of history, including a visit by Julius Caesar in 60 B.C. But the most consequential year remains 1493, when the first of the three caravels led by Columbus, the Pinta, arrived in port. It was from Baiona that news of the “discovery” of the New World spread fast and far. A life-sized replica rests in the harbor. The town’s dominant feature is the fortress on the hill. The site has a 2,000 year old history as a walled precinct but the existing structure dates between the 11th and 18th centuries, called Monterreal. Oh, and take a load off; we’re sleeping here. It’s now a hotel. Galicia, Spain. 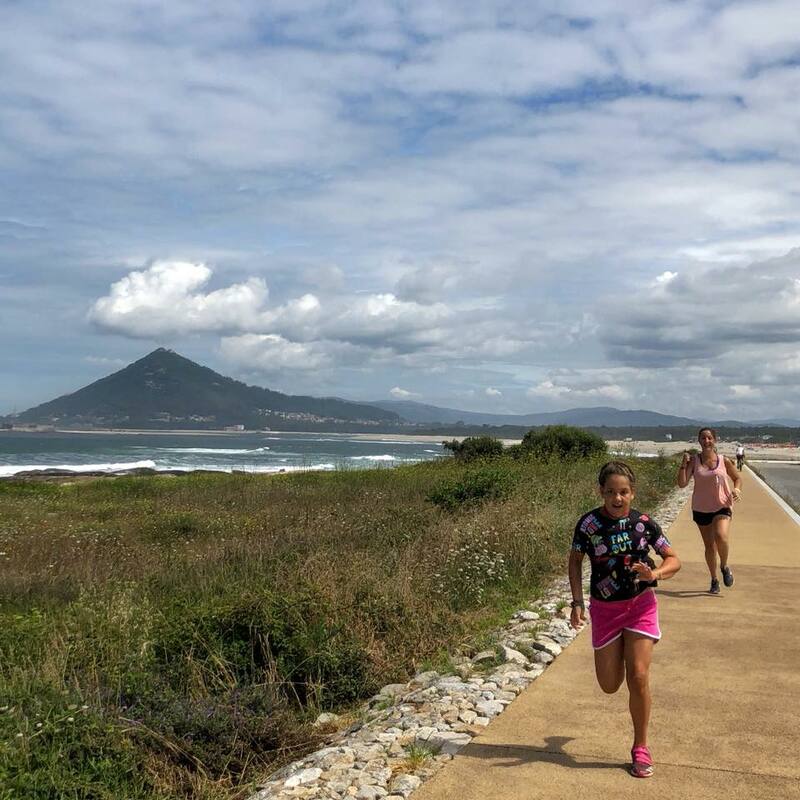 Big hills and a ferry ride across the Ria de Vigo on the way to Pontevedra, with the remains of a 14th-century church (Ruinas de San Domingos), and a church for pilgrims on the Camino trail (Iglesia de la Virgin Peregrina). The shape of the church was inspired by the scallop shell, symbol of those journeying to Santiago de Compostela. Galicia, Spain. 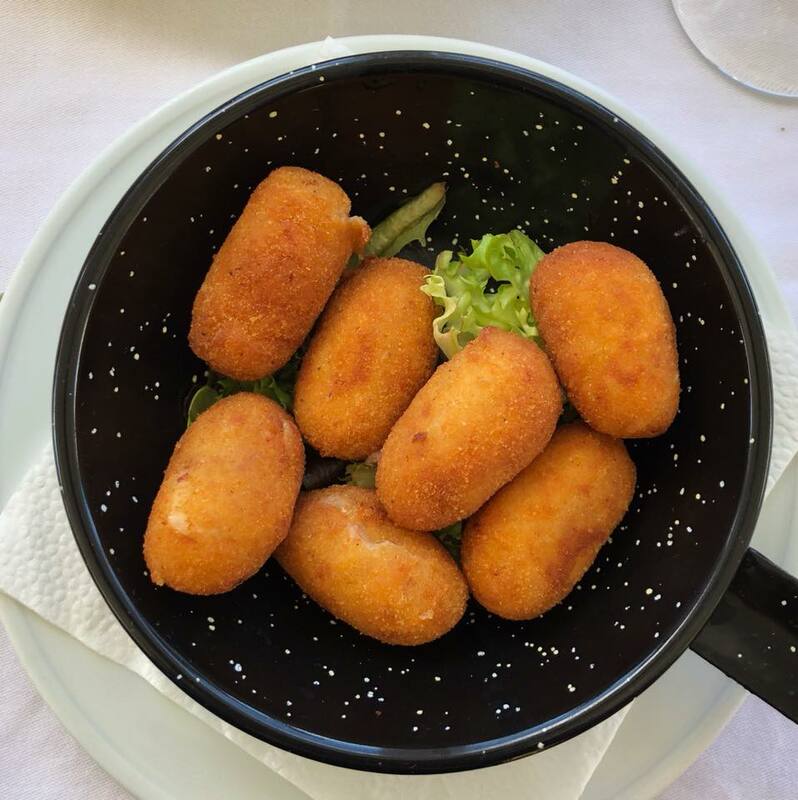 Pepper perfection: We’ve been gorging on this dish throughout this region but here we are in the town which gave these famed peppers their name, Padrón. Sweet, mild, and delicious when typically served fried with olive oil and salt. But every once in a while, there’s a spicy one in the batch. The local saying: whoever gets the hot pepper pays the bill. 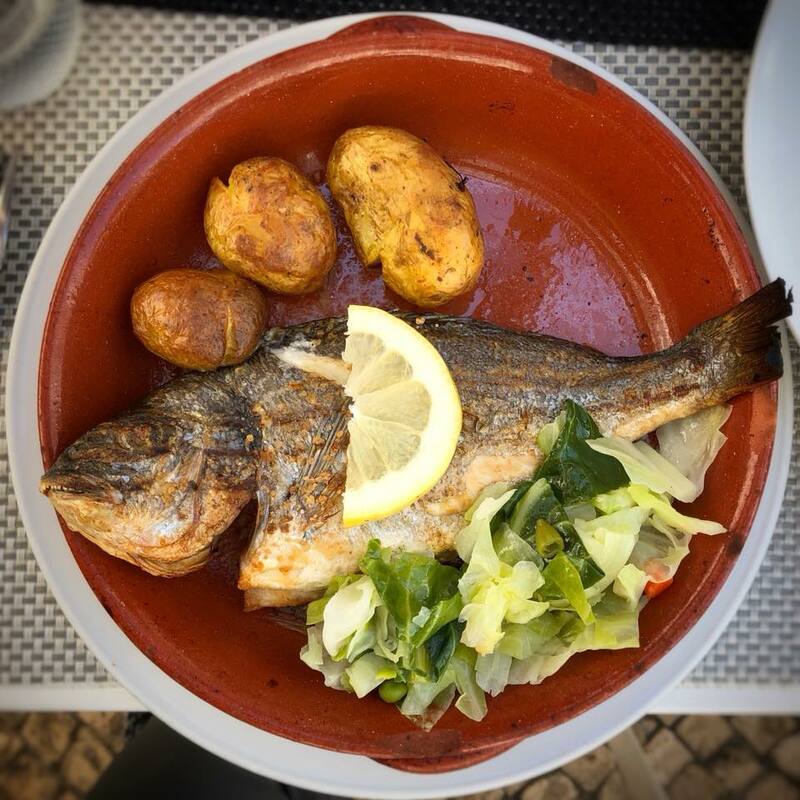 This divine dish was served at A Casa dos Martinez, the farm-to-table restaurant owned by Enrique and Marina Martínez. 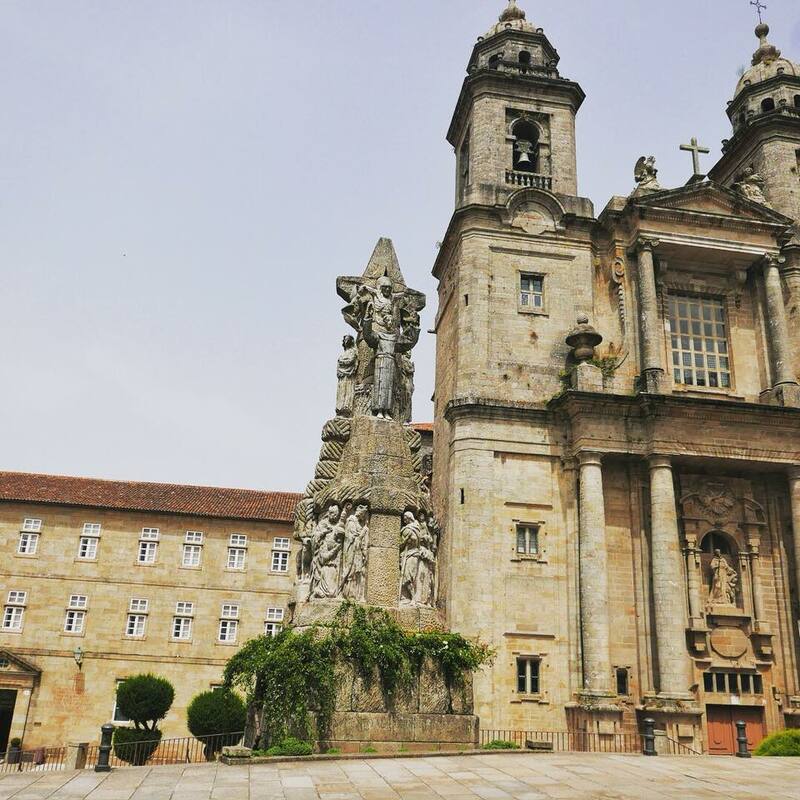 Padrón is also a stop on the Camino, and one of the churches here claims to have a rock that was part of the boat on which the beheaded body of the venerated Saint James traveled on when it arrived in Galicia on its way to its final resting place in Santiago. Galicia, Spain. 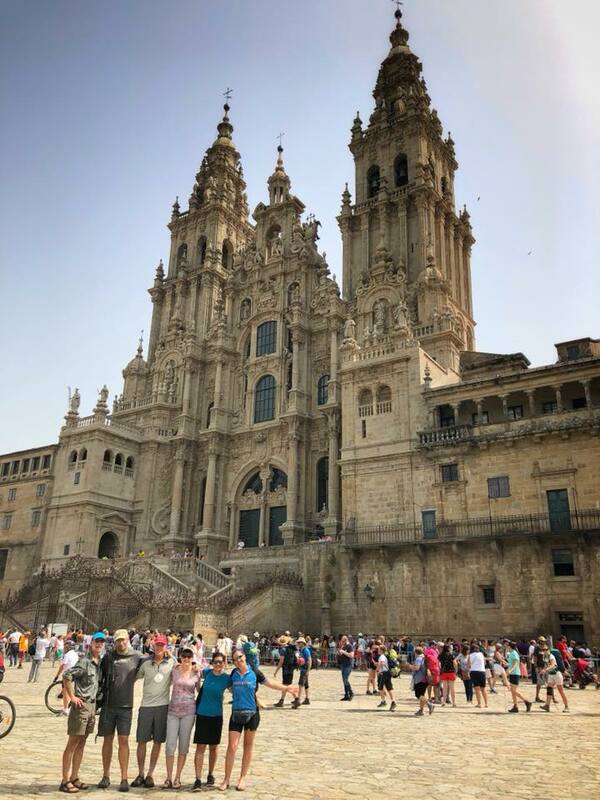 Buen camino: The last 20 miles from Padrón to Santiago de Compostela were difficult for me, especially after many days of cycling, the heat of the last two days, and a bit of tummy trouble yesterday. But nothing worthwhile is ever easy. We met many pilgrims along the way who journeyed farther, longer, and in far less luxurious fashion. 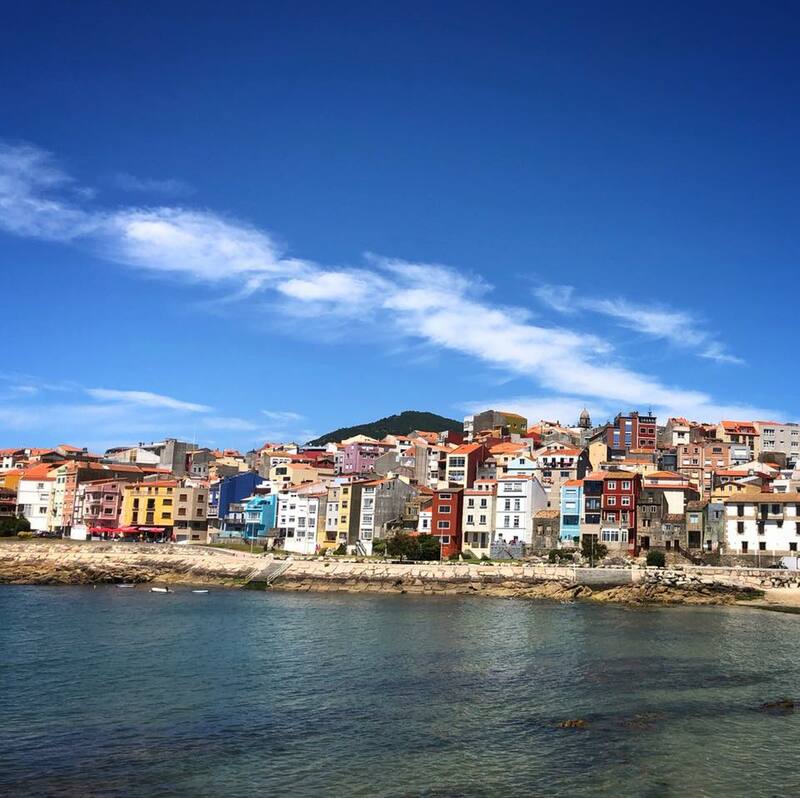 We crisscrossed parts of the Portuguese coastal and inland Camino. In this case, all roads lead to Santiago de Compostela. Whether believer or non-, or perhaps somewhere in between, if you made the journey, you are part of a community of fellow travelers in life, never really alone. I’m grateful to my new friends (Dave, Nancy, Bill, Annette, Denise, Laurie, Avi, Bob, and Catherine), the guides—now friends—who gave me a helpful push when I needed it (Luis and Montse), Maria Elena and Monica of ExperiencePlus! Bicycle Tours, and friends back home (Kathy, Kelly, Zachary, and Tracy) who helped me train, and my family whose love and support sustain me. This road ends, but the journey continues with new insights and clarity. Santiago de Compostela, Galicia, Spain. 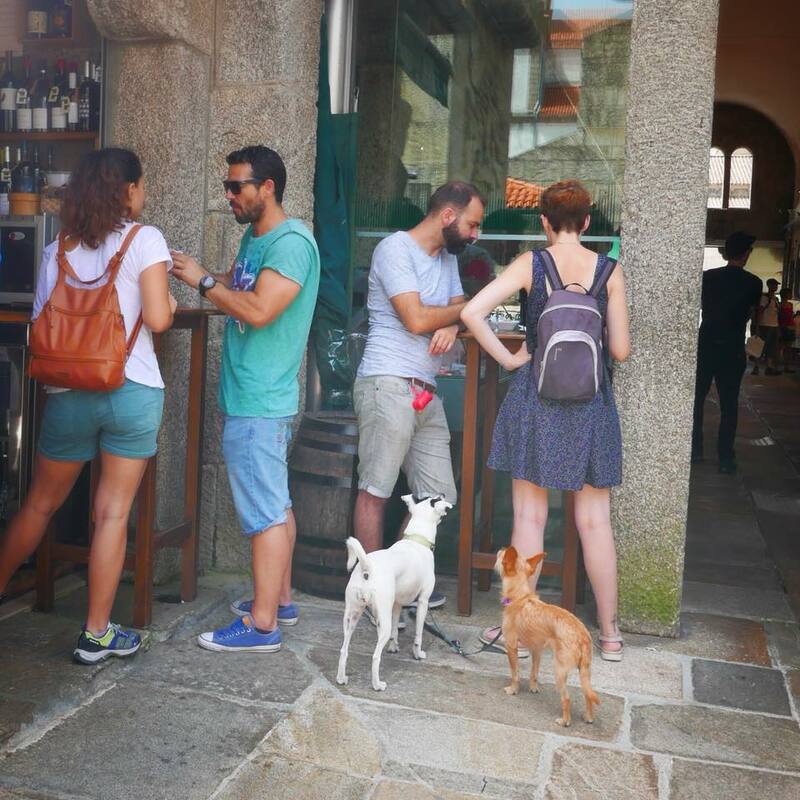 Pilgrim’s progress: In the summer months, some 1,000 to 1,500 people a day queue up at the registry to get their Compostela, certifying that they have walked or biked or even sailed one of the official Camino routes. To prove it, they present a passport with stamps collected at churches and lodgings and eateries enroute. Mine looks a little anemic as I kept forgetting to ask for stamps, but fellow traveler Dave White had no empty pages left in his. The Camino is a pilgrimage to the site where the faithful believe the remains of the apostle St James were found in the 9th century. Pilgrims made the years-long journey because it was believed that it would absolve sins and secure a spot in heaven (the rich could simply hire someone to make the journey for them). The thousand-year-old practice slowly died out, but was revived in its modern form following a UNESCO designation in the 1985. 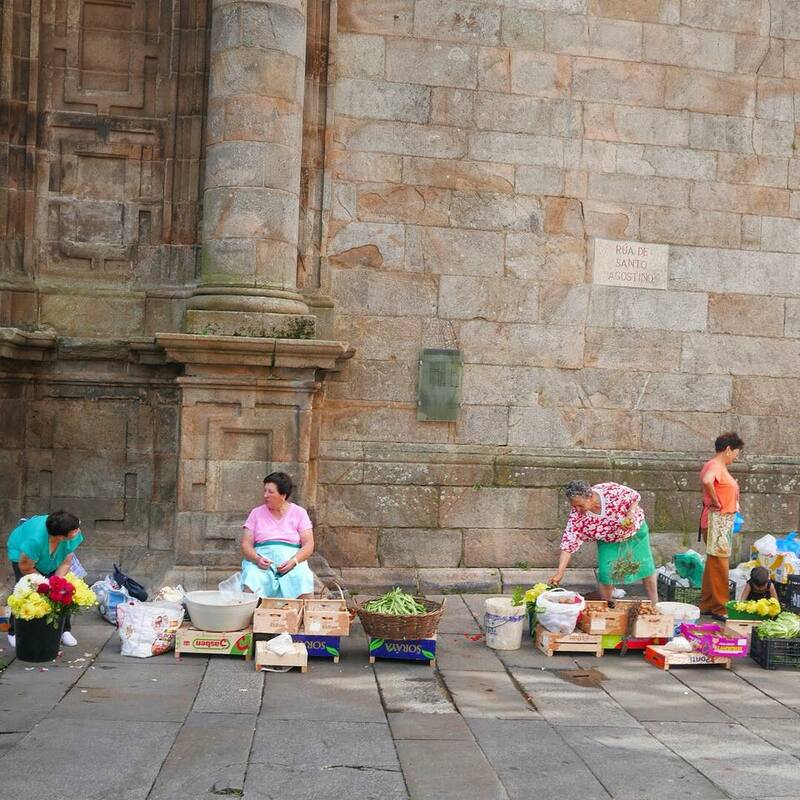 Today’s Camino is a personal journey done for religious, spiritual, or tourism reasons and the visitor mix in the town of Compostela reflects that. Besides the obligatory made-it-to-the-cathedral shot, there is the foot-on-kilometer-zero (made cuter with peripatetic pup). Compostela, Galicia, Spain. Get thee to a nunnery: Without the need for so many church-associated buildings, some have been turned into paradors to preserve the cultural heritage, like the San Francisco Hotel Monumento, an 18th-century convent on the very site St. Francis of Assisi is said to have selected when he came to Spain in 1214. Thankfully our quarters, while ascetic in aesthetic, have massaging showers and Wi-Fi. The attached church is a popular site for weddings. 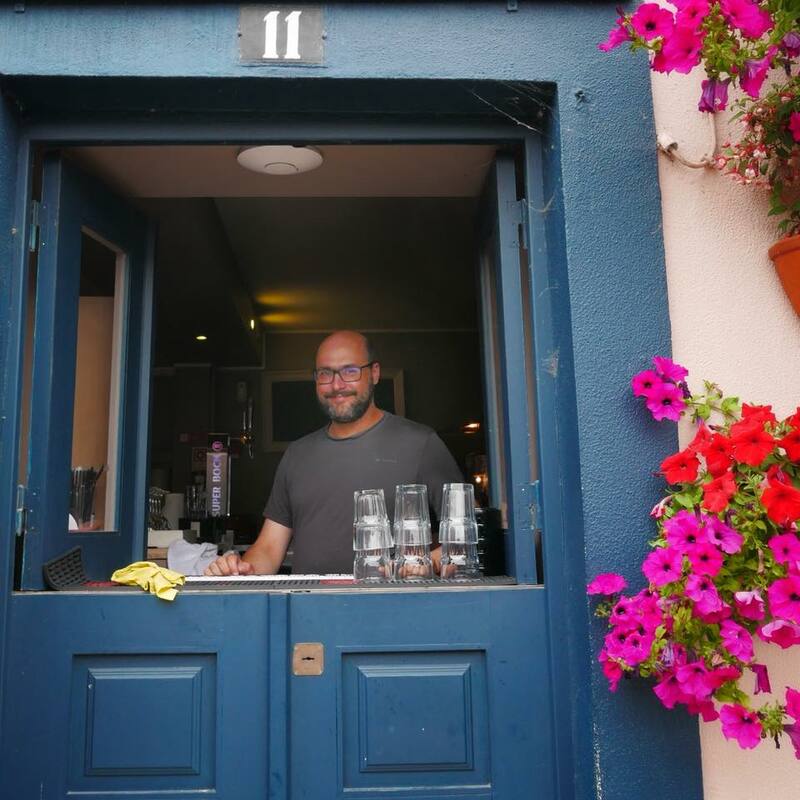 Other religious orders cater to locals and tourists to pay the bills; ring the doorbell of this convent and a cloistered Benedictine nun will open a window and sell you a Santiago almond tart, packaged for traveling. (Neighbors and family, guess what I’m bringing home for you?) Santiago de Compostela, Galicia, Spain. This granite city reverberates with life and color and sound: vegetable vendors at the market; restaurant goers snacking on pinchos (small bites like tapas) and their dogs salivating for scraps; troubadours hired to soundtrack a marriage proposal in the main square; professional opera singers moonlighting in the naturally acoustic covered archways; and full student orchestras offering recitals in the plazas. Some scenes are better experienced without photos. Picture aged nuns in full habits chanting during vespers in the hush of a crumbling Benedictine abbey. Or the exhausted joy writ large on the faces of young backpacking pilgrims who have walked the full 500 miles and richly deserve squatting on the plaza in a disheveled state greeting their Camino friends in a babel of tongues and posing for unceasing group selfies in front of a resplendent Cathedral facade they have no idea was only recently swathed in scaffolding. Now extrapolate these moments of life back a thousand years and you have an idea of the weight of this place. I leave touched, perhaps changed. Thanks for coming along with me. Santiago de Compostela, Galicia, Spain.